Although once a Roman military observation point against the local, troublesome Salassi people, the area has always been thought of as having spiritual qualities. In 1640, Tomaso Barberioda Guarene, a former soldier who was fed up with the violence of war, sought peace of mind here and built a chapel dedicated to San Giuseppe. Twenty years later, the bishop of Ivrea bestowed the official title of hermit on Tomaso and allowed a confraternity to be established. Tomaso was awarded with sainthood upon his death. Napoleon I confiscated the convent on his sweep through Piedmont and turned it into a fortress, recognizing its benefit, as did the ancient Romans, as a military observation point. From Napoleon’s family the property passed on to various owners, including poet Giuseppe Giacosa who provided a love nest for turn-of-the-century famed actress Eleonora Duse and Arrigo Boito during one of her tumultuous affairs. Ivrea plays host to one of Europe’s more unusual festivals, the “Battle of the Oranges.” On the days preceding Lent, masked balls are held and costumed medieval characters and Napoleonic troops take part in processions about town with music and fireworks in the sky. By Sunday, the festival culminates in a three-day free-for-all, and the pummeling-of-participants, or anyone for that matter, with 400,000 kg of Sicilian oranges. Origins of this unusual rite are said to date to the 12th century, when the amorous intentions of a local lord with a miller’s young daughter sparked a rock-throwing revolt from the poor, downtrodden townspeople. Annual riots in commemoration took place thereafter, until Napoleon ordered people to throw oranges instead of rocks and to wear red headgear to keep in solidarity with the Revolution. Today, you can escape becoming a walking glass of OJ if you, too, wear some sort of red headgear. By Ash Wednesday, the start of Lent, the orange pulp is cleaned up and everyone celebrates with an open-air feast of salt cod and polenta. Ivrea is 40 km north of Torino. Take the “Ivrea” exit from the A5 and follow the signposts toward Lago Sirio. 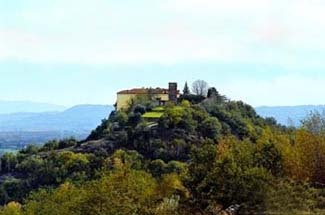 Just outside of the village of Ivrea, the Castello di San Giuseppe stands nestled on a hilltop, with five lakes below. Reflecting its monastic origins, it’s a peaceful, secluded, and romantic spot. Guest rooms have medieval touches as well, with their wonderful vaulted ceilings. Some rooms feature canopied beds, Oriental carpets, and Jacuzzis in thoroughly modernized bathrooms. Dining takes place in an ancient room with frescoes on the wall. During the summer months you can enjoy a candlelight dinner in the garden or under the gazebo among the palm and magnolia trees. If you’re in a hurry, or terribly important, there is a helicopter landing pad nearby.